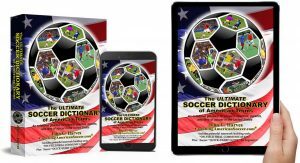 The ULTIMATE SOCCER DICTIONARY of American Terms is the largest and most complete U.S. soccer glossary ever published. Written by John Harves – successful collegiate player, coach, and experienced referee – this dictionary is the vital resource to help players, coaches, parents, fans, administrators, and journalists learn American soccer terminology and current jargon and better understand the game and the rules. Each version of the dictionary includes powerful learning tools — e.g., the entire “Quick-Start Guide” (more than 230 introductory terms especially helpful for those new to soccer); and selected “On-field Oral Communication” directives (excellent teamwork-building tools).